Gaura lindheimeri, plant profile and nurseries. 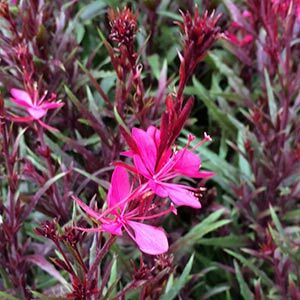 Often called the ‘Whirling white butterfly bush’, Gaura lindheimeri has white flowers with a pink tinge in spring to summer, and the flowers of this clump forming perennial do indeed resemble butterflies in the breeze. 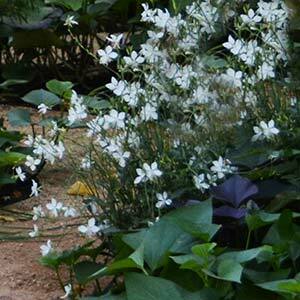 The flowers are help on long on long stems and ‘move around’ in the breeze, colour and movement in the garden. As with so many plants, new cultivars have been made available, so today we have ‘Butterfly Bushes’ in a number of colors. And as these attractive plants flower late in the season, often as other perennials are giving up, they are a welcome addition to the garden. A perennial reaching around 1.5m in height it does tend to self seed however it is a most useful and attractive plant. With its very textural looking flowers that appear on tall stems, this is a plant that lends itself to mixing in with other plants with similar qualities. Iopema batatas – The sweet Potato, which has great foliage. Poa labillaerdieri ‘ Sugan Bugan’ – Blue Tussock Grass. Best in warm to temperate zones, and unfortunately not suited to the humid north. Best in the middle or towards the rear of the border due to its height. Prune back to around 15cm above the ground in late winter, or deadhead after flowering. And when we say deadhead we actually mean chop them back hard. G. lindheimeri ‘Crimson Butterflies’ a lower growing cultivar.